Imagine this scenario: Mr. Jones has been your patient for years; he has always paid the portion of your bills not covered by his health insurance. Recently he cancelled a follow-up visit for his hypertension and did not request refills of his medications. He explains that he has been laid off and can't afford the COBRA premiums that would allow him to continue the health insurance from his former employer. As Mr. Jones’ medical home, what is your role in helping him to get the medical care he needs? Do you just hope he finds another job and insurance before his health is negatively impacted? Ask him to come in but not charge for the visit? What if he needs lab testing or referral for services not provided in your office? Do you provide medication samples? What resources and policies are in place to help your and your staff handle this kind of situation? A recent AAFP poll indicates that family physicians and their patients are feeling the brunt of the economic downturn. 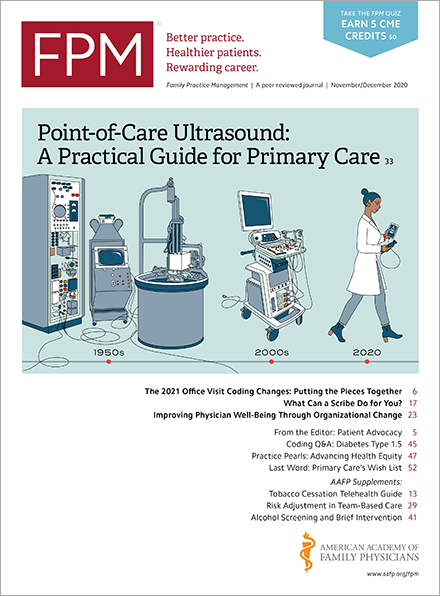 As recent AAFP survey reported in AAFP News Now found that 71 percent of respondents had provided more uncompensated care during the first months of 2009, and 66 percent reported taking specific actions -- such as cutting their fees, moving patients to generic prescriptions, or providing free screenings -- to help patients. These actions are admirable but not without potential complications. Could giving a discount be in violation of the terms of insurance contracts or legal statutes aimed at preventing inducement to receive services? What if any documentation is required? Don’t have all the answers? Here's some guidance on how to assist patients without harming your practice. First, physicians can offer discounts to patients who cannot afford to pay. The Office of the Inspector General made this clear as far back as 1994. The key is that the practice must have a policy for extending discounts based on the individual patient’s financial need. This policy should include verifying the patient’s household income, expenses and available assets. A standard form can be used to obtain this information. Practices should designate a person who will review the information, verify current income by checking a previous year’s tax return or current payroll and/or other income documents (e.g. unemployment benefit amount), and make a determination for either a complete write-off of a debt, percentage discount or payment plan. The Federal Poverty Guidelines(aspe.hhs.gov) are a good basis for establishing your standards for providing discounted or free care. For example, you might choose to provide discounted services to anyone whose family income is under 300 percent of the poverty guidelines for their family size, starting with a 20 percent discount on patient balances at that income level and increasing the discount percentage as the percent above the poverty guidelines decreases. Next, patients who lose their jobs may need information to help them make good decisions during tough times. Your practice can provide this information through the web sites listed below and by asking for any patient information handouts that might be available from your state and county health services. Look for more information on how to help patients with financial limitations in an upcoming issue of FPM. In the meantime, do you know of other ideas and resources for helping patients in need? If so, I hope you’ll comment and share them.